Living in the heart of the Silicon Valley, US design executive Bob Baxley is just a short drive away from some of the biggest names in technology and innovation, including Apple, Facebook and Google. 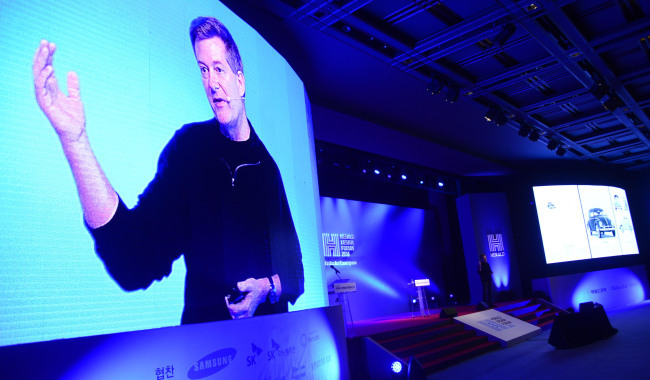 Most recently the head of product design at Pinterest, he now advises companies on the importance of design. 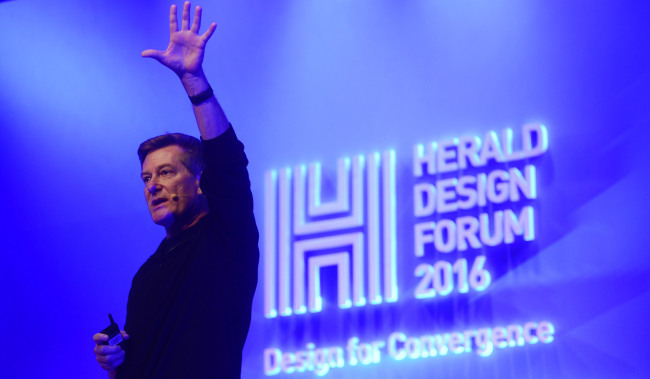 “I get the same question over and over, which is ‘How can we be more design-driven?’” he said at this year’s Herald Design Forum, held at the Grand Hyatt Seoul on Tuesday. However, this eager desire to create innovative design is only looking at the top of the iceberg, according to Baxley, who has also worked at Apple and Yahoo. During his time in the Silicon Valley, Baxley noticed a recurring trait in companies that fell behind their competitors. “When you talk to these founders, they don’t know exactly why they started their companies,” he said. Baxley believes that vision answers the critical question of why companies exist. Silicon Valley entrepreneurs, in particular, are concerned with making the world a better place. Google, for example, aims to “organize all the world’s information.” Although this seemingly simple, yet audacious, goal may never be realized, Baxley believes that it inspires the IT giant to continue creating and innovating. Since the early 20th century, US companies have followed a general evolutionary pattern, starting out technology-driven, then quality-driven, and ultimately becoming product-driven. No matter what developmental stage an organization wants to focus on, design -- ranging from logos to marketing campaigns -- must clearly reflect its vision. In 2013, Apple released a TV ad that featured a boy relentlessly on his iPhone throughout his family’s Christmas reunion. At the end, he reveals to his family that he had been filming and compiling footages of the their time together. There are also rare companies that go beyond technology, quality and product, and focus on making memories. “When Walt Disney was sitting on a park bench watching his two daughters play outside, he had the idea to create a space where kids and parents can interact together,” Baxley said. Over a decade later, that idea was realized in Disneyland. To live up to its motto “The Happiest Place on Earth,” the theme park has been designed to be experience-driven.